Several nutrients and vitamins such as bilberry and taurine help protect the optic nerve from damage. Glaucoma causes optic nerve damage. Optic neuritis and optic nerve atrophy are serious conditions that harm the optic nerve. Since the optic nerve sends electrical signals from the eye to the brain, any interruption damages vision. How does the optic nerve work? Which diseases damage the optic nerve? What does the research show about how nutrients, foods, and vitamins protect the optic nerve? Taurine, gingko biloba, a fruit called bilberry, Vitamin C, and Vitamin B12 among others have demonstrated their usefulness. The optic nerve is at the back of the eye. Made from ganglion cells, it transmits visual information from the retina to the brain. The optic disk leads to a strand of 125 million nerve fibers. 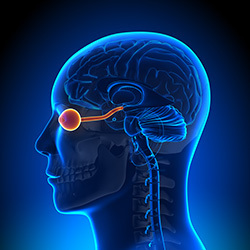 Electrical impulses travel down the optic nerve and are processed by the brain. The optic disk is only 0.06″ in diameter. These tiny structures are highly vulnerable to free radical damage. Nerve cells do not regenerate if they are damaged. Any break or damage in the optic nerve can cause noticeable vision loss, particularly peripheral vision loss. You may not have heard much about optic neuritis and optic nerve atrophy. Glaucoma is the most known and common cause of optic nerve damage. These eye diseases mostly strike seniors. Since damage to the optic nerve is irreversible, care must be taken to prevent, detect, treat, and support these diseases. Glaucoma: Approximately 1.9% of people over at 40 in the USA have glaucoma. That is 2.7 million people! Symptoms include progressive loss of peripheral vision, also called “tunnel vision.” The problem is related to the circulation of aqueous humor, the fluid that keeps the shape of the front of the eye. If intraocular pressure increases, it causes pressure on the optic nerve. Up to a quarter of glaucoma patients have normal intraocular pressure which may be diagnosed as “normal tension glaucoma”. Their glaucoma may be caused by hypersensitivity to normal pressure, sometimes due to thin corneas. Treatment options are limited: medication to lower eye pressure and surgery. Appropriate exercise, a healthy diet, avoiding smoking, and supplements have been shown to help. Optic Neuritis: Symptoms of inflammation of the optic nerve include pain in the eyes, dull colors, flashing lights, and/or visual impairment. This symptom can be caused by immune-related disease such as Multiple Sclerosis (MS). The optic nerve is surrounded by a myelin sheath that protects the nerve. When MS strikes, inflammation of the optic nerve is often the first symptom. Optic neuritis can also be caused by infections or for an unknown reason. Diagnosing and addressing the underlying cause is ultimately the long term treatment. Treating the active optic neuritis is the short term treatment. Optic Nerve Atrophy: Poor blood flow to the eye, trauma, toxins, genetics, and disease can cause the optic nerve to break down. An ophthalmologist can often see the optic nerve atrophy during an exam. Taurine is an amino acid that the human body manufactures in abundance. This chemical is essential for insulin sensitivity, electrolyte balance, immune modulation, heart health, and hearing. Taurine is also a potent eye antioxidant that supports retinal and optic nerve health. However, seniors do not usually produce enough taurine to stay healthy. Diabetes, cancer, and heart/liver/kidney failure can cause taurine deficiency. Supplementing taurine when needed can help extend health and life. For those at risk of deficiency, 500 mg to 1000 mg per day is a recommended supplemental dosage. Extracts from the Gingko Biloba tree have been recognized for their health benefits for thousands of years. This product is a traditional remedy for a wide range of conditions. Gingko Biloba is known as an adjunct treatment for cataracts and glaucoma. This extract also supports healthy circulation in the eyes and the whole body. Glaucoma patients have anomalies in their mitochondria, which provide energy to the cells.3 Gingko helps stabilize the mitochondria of the cells. This dark blue fruit is rich in anthocyanin pigments, which are very powerful antioxidants. Many studies have demonstrated bilberry’s positive effect on eye health. For example, a study of 300 normal-tension glaucoma patients found that bilberry and Ginkgo Biloba improved symptoms. Combining French maritime pine bark with bilberry lowered intraocular pressure by up to 24% in people with normal eye pressure.8 Recommended: 180 mg to 240 mg daily. Our bodies are unable to manufacture ascorbic acid. However, vitamin C is crucial to good health. Glaucomic eyes had significantly less vitamin C than healthy eyes in a study.9 Low vitamin C in the blood and vitreous humor might aggravate meshwork blockage in seniors, causing glaucoma.10 Large doses of vitamin C reduced intraocular pressure by 10 points (10,000 mg per day).11 Taking a total of at least 2,000 mg of vitamin C throughout the day from whole fruit is better than synthetic vitamin C. The best vitamin C supplements are ascorbated and buffered with bioflavonoids are the best. Take vitamin C supplements with food. Vitamin B12 is notable as a nutrient that vegetarians and vegans may need to supplement. Abundant in animal products, vitamin B12 was found to help protect glaucoma patients from vision loss.12 The study used very high doses: up to 1000 mcg to 1500 mcg per day. The US RDA for vitamin B12 is 2.4 mcg per day for adults, so consult a physician first. Vitamin B12 supplements can be taken daily or weekly. The optic nerve is safely tucked away at the back of the eye. We might not appreciate the importance of protecting the optic nerve until disease strikes. Glaucoma is particularly common and devastating. Glaucoma is called the “silent thief” because peripheral vision loss is so gradual. Take care of your eyes by eating a healthy diet, getting plenty of exercise to increase circulation, avoiding smoking, and taking supplements as needed. Make sure you keep your regular eye exam appointments.